For that very reason Southern Utah University is working to increase study abroad opportunities for students and make it financially attainable. They awarded $86,750 in study abroad scholarships in the 2016-17 academic school year alone. The SUU study abroad program, which is organized through the Office of Learning Abroad, took more than 350 students abroad for a total of 2,280 days to 20 different countries from India to Peru. Andria Burdick, a junior criminal justice and chemistry major from Loveland, Colorado, traveled to Nicaragua to learn about landscape and animal life. She surprised herself by how adventurous she was during her trip. She hiked, kayaked, visited wildlife reserves, hunted insects and tried traditional food. Ammon Treasure traveled to India to expand his anthropological studies. He is a senior anthropology major from southern Utah who enjoys travel and experiencing the world’s incredible diversity. He believes every student should go on a study abroad. Taylor Morgan is a junior psychology major from Irvine, California. She just returned from a study abroad to Spain where she visited historical sites, watched bull fighting and learned valuable lessons from another culture. 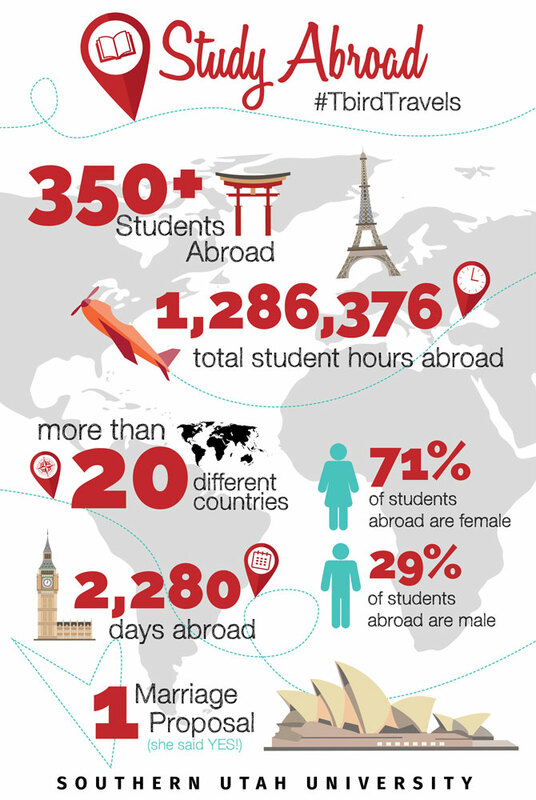 To learn more about the SUU study abroad program, visit the SUU Office of Learning Abroad.